Here is a look at the 45th Parliament where the Honourable Tony Smith quietly overtook the Honourable Bronwyn Bishop as the Speaker who has delivered the most two-hour suspensions via the 94(a) ruling. Interestingly, Tony Smith did not ‘name’ anyone during the 45th Parliament. Naming a sitting member means a 24-hour or 94(b) suspension. In the 166-days parliamentary days that Tony Smith occupied the Speakers chair he averaged 2.5 suspensions per day. His suspension average topped >3 between the 7th September to 18th October 2017 with his highest average of 3.08 recorded on the 14th September 2017. Members of the opposition represented 95.9% of his suspensions with only 17 Coalition members asked to take a 2-hour break. Anthony Pasin was the most removed MP from the Coalition with four suspensions. In the naughty corner the most for the 45th Parliament was the member for Bruce, Julian Hill who received 29 two-hour suspensions. The most suspended female from the ALP benches was a tie between Emma Husar and Terri Butler with 21 apiece. An interesting data point: When Emma Husar initially reached 21-suspensions on the 19th June 2018, her colleague Julian Hill had only 19-suspensions. I suspect if Emma didn’t get caught up in an internal investigation, she may have been the most suspended member for this Parliament. Parliament of Australia. House Hansard. Accessed 12th April 2019. Parliament of Australia. Hon Tony Smith MP (Image). Accessed 12th April 2019. A quick-fire chart this week but notable because Scott Morrison has just called the election for the 18th May 2019. 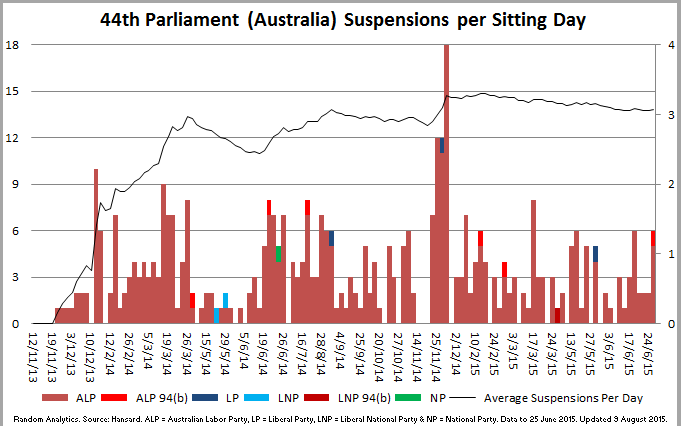 The Member for Casey, Tony Smith who has acted in the role of the Speaker since 10th August 2015 has quietly delivered the most suspensions since the inception of the 94(a) rule. He has averaged 2.5 suspensions per sitting day. It will take me a couple of days to work though the 45th Parliament data. Questions that will be answered will include who was the most suspended Parliamentarian on both sides of the house. Parliament of Australia. House Hansard. Accessed 11th April 2019. As the 45th Parliament comes to an end I was reflecting on what a good job the Honourable Tony Smith MP has done in creating a modicum of order in the chaos of the House of Representatives. Before I could look at the current Parliament I thought it might be worthwhile finalising my data from the previous 44th Parliament (Nov 2013 – May 2016). Here’s a look at the Top 12 MPs who were suspended according to standing order 94(a) during the 44th Parliament. 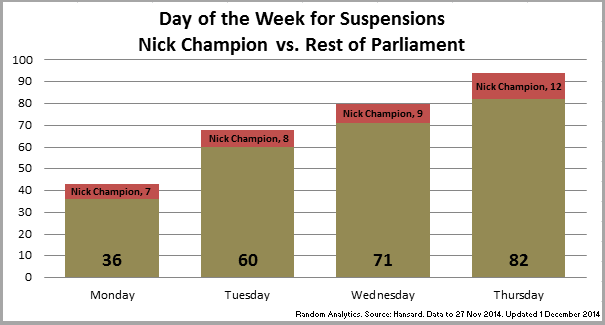 The Member for Wakefield, Nick Champion finished the 44th Parliament with the most suspensions (70). He beat his colleague, the Member for Moreton, Graham Perrett (55) with the former Attorney General, Mark Dreyfus coming third (36). The woman most often suspended was the Member for Griffith, Terri Butler with 34 suspensions. Parliament of Australia. House Hansard. Accessed 2-3rd April 2019. Parliament of Australia. Mr Nick Champion MP (Image). Accessed 4th April 2019. Parliament of Australia. Ms Terri Butler MP (Image). Accessed 4th April 2019. Wikipedia. Bronwyn Bishop (Image). Accessed 3rd April 2019. Wikipedia. Tony Smith (Victorian politician) (Image). Accessed 3rd April 2019. Tomorrow, on the first day back from the winter break the Coalition government will sit down and decide who will be the new Speaker of the Parliament after Bronwyn Bishop resigned from the role following revelations that she took a helicopter to a Liberal Party fundraiser at a cost of more than $5,000 to the tax-payer rather than choosing another, cheaper form of transport. 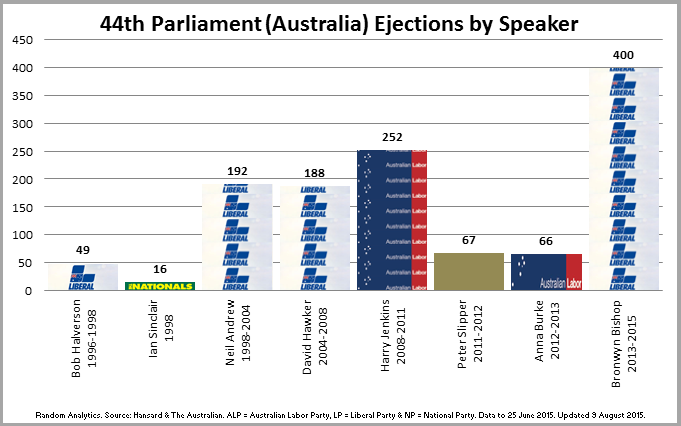 Here is an updated look at the charts for Parliamentary suspension during the Bronwyn Bishop era. As Speaker of the Parliament, Bronwyn Bishop officially spent 130-days in the chair and suspended 400 Members of Parliament (the highest total on record) including 18 MPs in a single day (again, the highest on record). 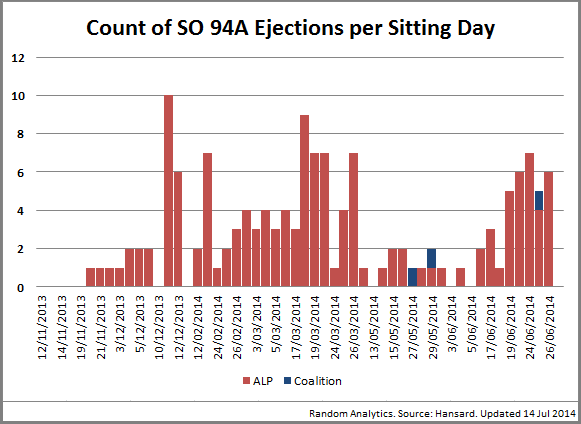 393 (98.3%) of those ejections were from the ALP and seven were from the Coalition. Included in the total were six 94(b) Naming’s where MPs are suspended for 24-hours rather than just the hour as per the 94(a) suspension. They were Mark Dreyfus (twice), Wayne Swan, Ed Husic, Jim Chalmers and Andrew Laming (from the LNP). On the second 94(b) suspension for Mark Dreyfus he was suspended for the rest of the day and then a further three days. Interestingly, during 2015 Bronwyn Bishop’s suspension average has moderated (as represented by the black line within the chart) but only slightly and it still stayed above 3 for the entire year. Here’s a look at the Top 12 MPs who were suspended during Bronwyn Bishop’s time as Speaker of the Parliament. The Member for Wakefield, Nick Champion continues to lead the count at 53 and is currently 12 suspensions ahead of his colleague the Member for Moreton, Graham Perrett (at 41). Coalition Members who have been suspended include Ewen Jones (twice), Michael McCormack, Luke Simpkings and Andrew Nikolic (twice) and Andrew Laming (94b). Finally, a look at how the Speakers of the Parliament have stacked up in terms of suspensions during their tenure (and no surprises on who tops the list). On a final note the Sydney Morning Herald did a very good analysis of the 29th Speaker’s time in office which is worth a read. 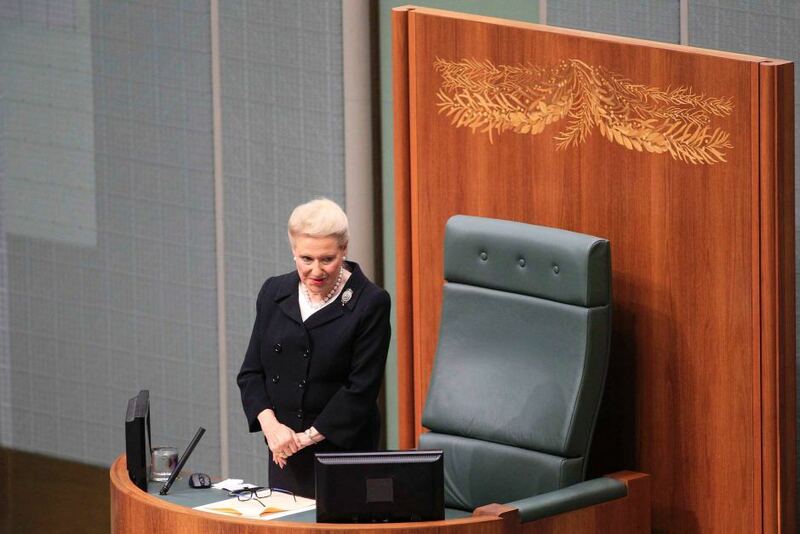 Bronwyn Bishop’s greatest hits (or misses) as Speaker of the Parliament. Click through for the mosaic of Bronwyn Bishop created using photos of MPs who were suspended from Parliament during her time in the chair. Parliament of Australia. Hansard. Accessed 9 August 2015. Federal Parliament has embraced the schoolyard tradition of an “end-of-year muck-up day” setting new standards in misbehaviour. In a raucous Question Time to end Parliament’s penultimate sitting week, the Speaker, Bronwyn Bishop, suspended 18 MPs – all Labor. With a massively depleted front and back bench behind him, a frustrated manager of Opposition business Tony Burke rose to inform the House “18 people in one Question Time is an all-time record since Federation”. Bishop says claims she picked on Labor MPs ‘pathetic’ She broke the previous one-day record for suspensions which had stood at 12. The Speaker almost racked up 50 suspensions in one week, but fell short at 47. Ms Bishop’s personal total of suspensions for the 44th Parliament stands at 285. During that week there were some discrepancies in 94(a) suspension counts. On 25 November Hansard detailed nine suspensions while the Sydney Morning Herald reported ten and The Australian reported 12. I put a request for clarification into the Australian Parliament and received a wonderfully detailed response from Assistant Director, Chamber Research Office, Department of the House of Representatives who confirmed 12 suspensions on the day. (Hat tip to the Australian Parliament). Here is a look at the Standing Order 94(a) and Standing Order 94(b) suspensions for the 44th Parliament of the Commonwealth of Australia House of Representatives to the 27th November 2014. It is also my intent to update these charts at the end of the last sitting week for 2014. 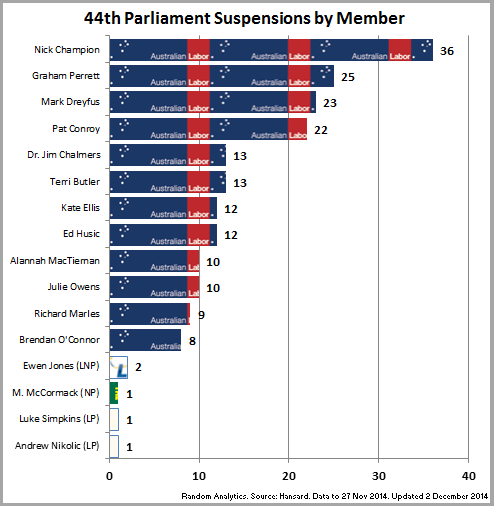 The 44th Parliament of Australia Suspensions per Sitting Day details the total amount of suspensions with breakdowns by political party. As noted in the ABC story the final day of the second last week was the most suspensions in a single day since Federation (1901). 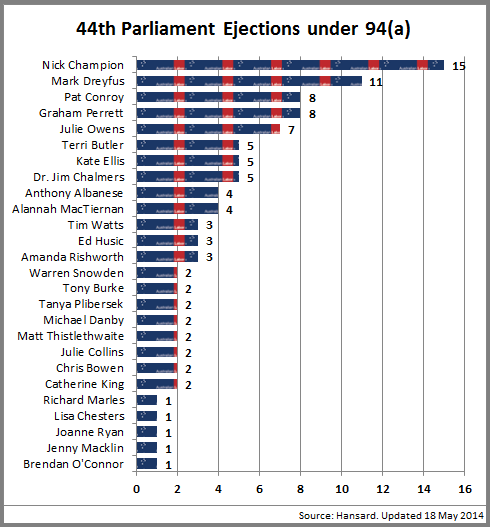 Those named under Standing Order 94(b) have also been noted in red (they are Mark Dreyfus, Wayne Swan and Ed Husic) and the Coalition members ejected have been included under different colours depending on which Party they belong to. 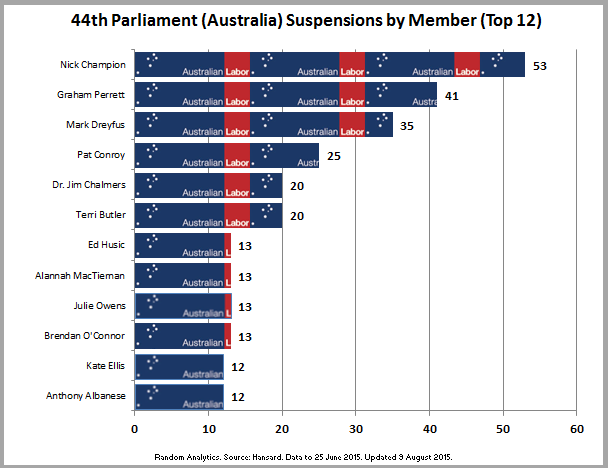 The 44th Parliament Suspensions by Member details the top 12 ALP and the four Coalition Members of Parliament to have been suspended thus far. The Member for Wakefield, Nick Champion continues to lead the count at 36 and is currently 11 suspensions ahead of his colleague the Member for Moreton, Graham Perrett. Ewen Jones, Michael McCormack, Luke Simpkings and Andrew Nikolic from the Coalition have also been suspended. 7-Suspensions: Anthony Albanese, Chris Bowen, Warren Snowden & Tim Watts. 4-Suspensions: Tony Burke, Julie Collins, Michael Danby, Joanne Ryan and Matt Thistlethwaite. 3-Suspensions: Lisa Chesters, Tanya Plibersek and Wayne Swan. 2-Suspensions: David Feeney, Joel Fitzgibbon, Michelle Rowland & Kelvin Thomson. Mark Butler, Jason Clare, Sharon Claydon, Andrew Giles, Jill Hall, Clare O’Neil and Melissa Parke all have one suspension each. The final chart is Day of the Week for Suspensions. The obvious data point and the one which is consistently pointed out by the media is that the final day of the sitting week (usually a Thursday) is the most often day where members are ejected. Interestingly, the difference between Wednesday and Thursday was much closer than the anecdotal evidence suggested. In total Mondays had 43 suspensions, Tuesdays 68, Wednesdays 80 and Thursdays 94. If the week commencing 24 November did not occur then it would have been 68/76 for Wednesday/Thursday. For a bit of fun I split the data between Nick Champion (with 12.6% of all suspensions for the 44th Parliament) and the rest of the House. Parliament of Australia. Hansard. Accessed 2 December 2014. Here is a look at the Standing Order 94(a) and Standing Order 94(b) ejections for the 44th Parliament of the Commonwealth of Australia House of Representatives to the end of the 14th week (8 July 2014). The first chart details the list of those ejected from the house under Standing Orders 94(a). At the end of the 14th sitting week there were 144 ejections, of which 141 (98.0%) were from the Australian Labor Party, two (1.4%) were from the Liberal National Party and just the one (0.6%) for the National Party. Nicholas David “Nick” Champion MP (20-ejections) is the ALP Member representing the electorate of Wakefield (SA). He won the seat at the 2007 Australian federal election. Mark Alfred Dreyfus QC MP (12-ejections) is the ALP Member representing the electorate of Isaacs (WA). He won the seat at the 2007 Australian federal election. He is the former Attorney-General, Minister for the Public Service and Integrity, Minister for Emergency Management, and Special Minister of State in the Second Rudd Ministry. Pat Conroy MP (11-ejections) is the Member representing the electorate of Charlton (NSW). He won the seat at the 2013 Australian federal election. Ewen Jones MP (2-ejections) is the Member representing the electorate of Herbert (QLD). He won the seat at the 2010 Australian federal election. There have only been two Standing Order 94(b) ejections thus far. They are Mark Dreyfus (ALP) and Wayne Swan (ALP). 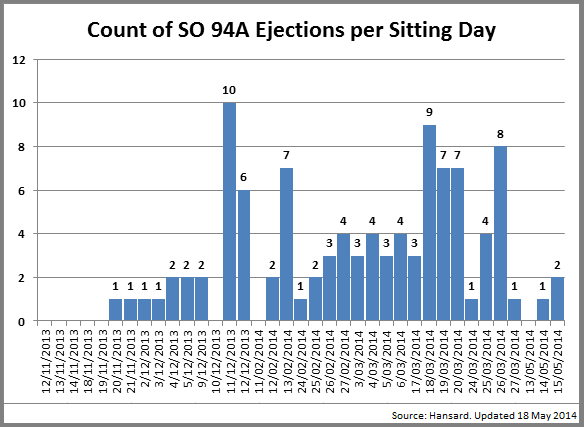 The final chart is a look at the Standing Order 94(a) ejections by sitting day. As you can see they tend to pick up in the second last week of each large sitting period or at the end of the calendar year. In this update I’ve been able to include some colour as three ejections have come from the Coalition. Image Sources: Bronwyn Bishop’s image care of the ABC while photos of individual members are taken from their official Australian Parliament House photo. Peter Whiteford did an excellent article for The Guardian earlier this week which highlighted the fact that the poor will suffer the most through to 2017. Given that the Treasurer (Joe Hockey) and the Prime Minister seemed convinced that the budget pain is being shared across the board I thought I might utilise some of the research data that Professor Peter Whiteford and PhD candidate Daniel Nethery have come up with for an infographic. Any mistakes are unintentional and are of my own making, thus not reflecting the excellent work of Peter and Daniel. The Guardian piece can be found in full (including the table) here. 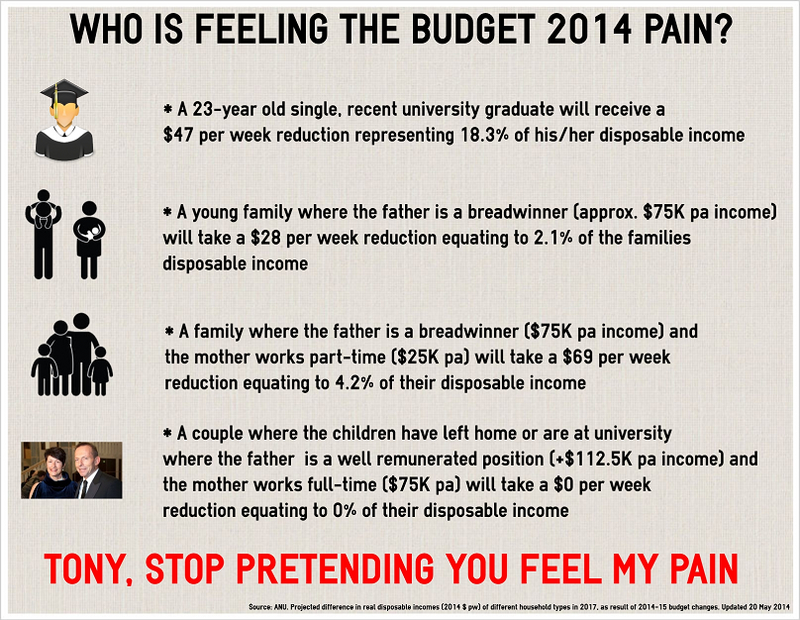 Working-age poor will suffer most pain from Australian budget. Image: Tony and Margie Abbott photo care of the ABC. Fran Kelly’s final point on Insiders (18th May 2014) was that the ejection of Terri Butler (Member for Griffith) on the previous Wednesday under Standing Orders 94(a) brought the count to 100 for Labor and zero for the coalition (and minor parties). The Speaker for the 44th Parliament is renowned Conservative Bronwyn Bishop and it looks like she is taking no prisoners. After a detailed look online for the data to support Labor’s claim of 100-0 I could find nothing outside of the claim so I spent a number of hours trawling through both Hansard and Judith Ireland’s excellent Politics Live Blog and put together the figures myself. 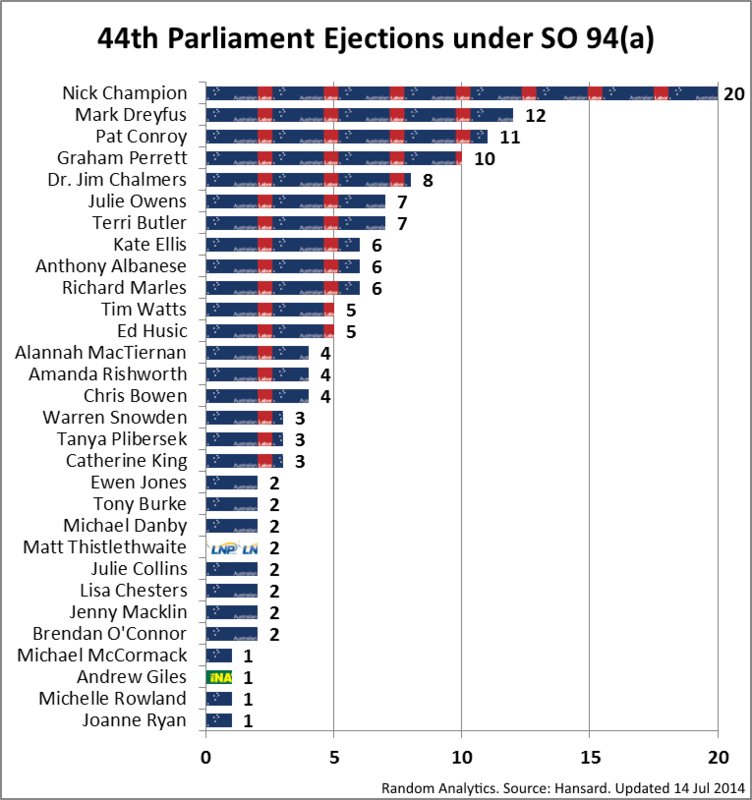 ***** Please note that ALL charts of Standing Order 94(a) ejections during the 44th Parliament were updated with public source information to the end of the ninth sitting week (15 May 2014) ***** The first chart details the list of those ejected from the house. Early money was on the Member for Wakefield to take out the prize for most ejections and he remains the favourite. Nicholas David “Nick” Champion (15-ejections) is the ALP Member of the Australian House of Representatives representing the electorate of Wakefield (SA). He won the seat at the 2007 Australian federal election. Mark Alfred Dreyfus QC MP (11-ejections) is the ALP Member of the Australian House of Representatives representing the electorate of Issacs (WA). He won the seat at the 2007 Australian federal election. He is the former Attorney-General, Minister for the Public Service and Integrity, Minister for Emergency Management, and Special Minister of State in the Second Rudd Ministry. Pat Conroy and Graham Perrett (both 8-ejections). Pat Conroy is the Member for Charlton (NSW) and Graham Perrett is the Member for Moreton (QLD). Now a final look at the Speakers ejections by Sitting Day. According to the APH the 10-ejections which occurred on the 11th December 2013 are not the most recorded but at 102 ejections over 37-sitting days the average, which currently stands at 2.8 might well be worth consideration. When the tally hits 200 it might be worth looking into.